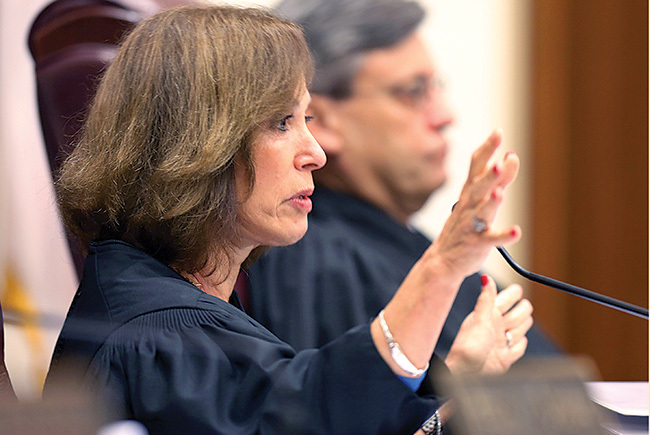 Florida Supreme Court Justice Barbara Pariente has authored a long list of landmark decisions. On the morning of March 4, 2015, a day after the start of the annual legislative session, some of the most powerful politicians in Florida crossed the street from the state Capitol to watch the Florida Supreme Court consider the fate of the state’s newly drawn congressional districts. There are seven justices on the Florida Supreme Court. But that morning, every eye in the courtroom was fixed on one judge in particular. From her seat immediately to the right of the chief justice — the traditional place for the court’s senior member — Justice Barbara J. Pariente spent the next hour interrogating both sides of the case. A thick binder open in front of her, documents splayed across her desk, Pariente interrupted attorneys, demanded follow-ups when they did not answer precisely and even occasionally stepped in to debate her fellow justices. Pariente asked more than two dozen questions during the 66-minute hearing, more than all the other justices put together. On July 9, 2015, she dropped the hammer, writing in her opinion that Florida lawmakers had deliberately violated the anti-gerrymandering standards that voters had written into the state constitution in 2012. Writing on behalf of a 5-2 majority, she ordered lawmakers to redraw the maps to the standards that she herself had spelled out. They weren’t able to do so; the courts wound up approving maps drawn by groups that had challenged the lawmakers’ maps. The ruling was one of seven major opinions — 591 pages of precedent- setting jurisprudence — that Pariente wrote during the yearslong redistricting battle. It added to a long, and still-growing, list of landmark decisions she has authored shaping Florida law on everything from civil rights to executive power. And it cemented her reputation as the most important judge on the state’s highest court. In fact, some people in Tallahassee consider Pariente — a 68-yearold grandmother who loves books and Broadway — the most important person in Florida politics right now. Pariente was born on Christmas Eve 1948 in New York City, the first of two daughters. Her father sold bulk chocolate for the Blumenthal Brothers Chocolate Co., the maker of Raisinets, Sno Caps and Goobers. Her mother had graduated from high school at 15 and took a job paying $5 a week to do secretarial work for an attorney. The family moved to suburban New Jersey when Pariente was 9. She studied broadcasting at Boston University and then enrolled in law school at George Washington University, where an uncle, an antitrust lawyer who served on a commission advising President Dwight Eisenhower, had once been a professor. There were about 17 male students for every female student. During law school, Pariente interned in the District of Columbia public defender’s office and was assigned to the case of a woman who had been arrested for prostitution. She and the lawyer she was working for successfully argued that police were unequally enforcing the law because they were using only male detectives for undercover stings — and, as a result, only arresting the prostitutes themselves and never the “johns” that were soliciting them. Pariente graduated fifth in her class. Unable to find a job at a D.C. firm, she moved to Florida, drawn, after two decades in the Northeast, by the prospect of warmer weather. She landed a two-year clerkship with the late Norman Roettger Jr., a federal judge in the Southern District of Florida. From Roettger’s Fort Lauderdale courtroom, Pariente met some of the top litigators in Florida. They were as impressed with her as she was with them, says Aaron Podhurst, a Miami attorney. “She was very inexperienced, and Judge Roettger was a very strong judge. But she maneuvered that very well,” says Podhurst, who encouraged Pariente to pursue a career as a trial lawyer. Once the clerkship ended, Pariente was hired as an associate at Cone, Wagner, Nugent, Johnson, Hazouri & Roth of West Palm Beach. She was assigned to the trial team under Al Cone, founder of the Academy of Florida Trial Lawyers (known today as the Florida Justice Association). Her first case involved a workplace accident at a Pepsi bottling plant. Forming bonds Florida courtrooms in the mid- 1970s were, Pariente says, an “allwhite- male club,” an environment where rival attorneys and judges — all men — regularly referred to her as “honey.” There were a few women practicing at Palm Beach County courtrooms at the time, and they bonded over the experience. They would meet regularly for dinner and drinks, often at one another’s home, in something of an informal support group. Some of Florida’s most important female trailblazers were at those dinners: Rosemary Barkett, who would become the first woman to serve on the Florida Supreme Court; Edna Caruso, one of the state’s first female appellate attorneys; Mary Lupo, the first female judge in Palm Beach County; and Lois Frankel, who now represents the area in the U.S. Congress. “We were just having fun and keeping our nose to the grindstone and trying to show the men that we were serious about being good lawyers,” Caruso says. Pariente married Dennis Koehler, an environmental law attorney whom she had met in law school and who was elected to the Palm Beach County Commission in 1976. They had a son, Joshua, in 1977, but divorced in 1980. Pariente remarried six years later, to Fred Hazouri, a partner at Cone Wagner who later became an appellate court judge. They blended their families, Pariente becoming a stepmother to two children. The couple celebrated their 30th anniversary last April. By 1980, Pariente had made partner at her firm. Three years later, she and another partner, Louis Silber, decided to start their own practice in West Palm Beach. Silber says Pariente immersed herself in the lives of her clients, forging personal and enduring bonds. She continued sending Christmas cards to former clients years after their cases had concluded. At her peak, Pariente was handling between 50 and 75 cases a year and making weekly court appearances. She won a $1.2 millionsettlement from Honda in a case in which a 9-year-old girl’s leg was amputated following a motorcycle crash. Honda fought to keep critical documents secret in the case, but Pariente persuaded the court that the car manufacturer had willfully violated discovery orders, prompting the court to enter a default judgment of liability. Later, she won $1.2 million from International Harvester following a tractor rollover and $560,000 from Nationwide on a bad-faith insurance claim. She represented pepper farmers when they were sold defective seeds by an agribusiness and Erika Mattfield Kirk when she filed for divorce from her husband, former Florida Gov. Claude Kirk. The pepper farmers won, and the Kirks reconciled. Pariente’s work drew the attention of Florida Gov. Lawton Chiles. Chiles, the last Democrat to serve as Florida’s governor, appointed Pariente in September 1993 to a seat on the 4th District Court of Appeal. Four years later — in December 1997, a year before his death — Chiles elevated her to the Supreme Court. The second woman to serve on the Florida Supreme Court was still celebrating when she received a phone call from then- Justice Charles Wells: “You’re going to have to bone up because we have two death warrants,” he told her. “That was really my introduction to the court,” she says. On the court, Pariente has written decisions extending anti- discrimination protections to pregnant women, prohibiting the state from sentencing juvenile offenders without the possibility of parole and ensuring that the woman who provides the egg in a lesbian relationship has the same parental rights as the woman who carried the child to term. She has been willing to defy precedent. In a 2001 case that still infuriates business lobbyists, Pariente wrote the opinion declaring that a victim who slipped on a banana peel in Publix could sue for negligence, shifting the burden to Publix to produce evidence that it exercised reasonable care under the circumstances. Wells, who retired from the Supreme Court in 2009, says Pariente has remained consistent since joining the court. “I think she arrived fairly well-formed,” he says. Pariente has at times proved prescient: As early as 2003, she warned in her opinions that Florida’s death penalty was unconstitutional, correctly anticipating a decision the U. S. Supreme Court handed down last year. But she has at times overreached: In a 2011 opinion, Pariente wrote that a drug-sniffing dog alone could not provide police with probable cause to search a vehicle. The decision was later overturned by the U.S. Supreme Court. In March 2003, Pariente was diagnosed with breast cancer. She underwent a 14-hour double mastectomy and reconstructive surgery, followed by a summer of chemotherapy during which she lost her hair. She initially wore wigs to the courtroom until, she says, she tired of “masquerading as if all was normal.” On Oct. 7, she walked into the courtroom proudly bald. “She has more energy than God should ever give one person,” jokes former Justice Kenneth Bell, who served on the court from 2002 to 2008 and often wound up on the opposite side of Pariente in cases. What has most struck lawyers, legislators and others who watch the court closely is Pariente’s seeming knack for landing the assignment to write many of the Supreme Court’s most high-profile opinions. She wrote the ruling in Bush v. Schiavo invalidating a law passed to keep Terri Schiavo — a woman in an irreversible vegetative state — alive on feeding tube. She wrote Bush v. Holmes declaring one of former Gov. Jeb Bush’s prized voucher programs unconstitutional. And she wrote the opinion in Castellanos v. Next Door Co., throwing out strict limits on attorney fees that the Legislature had imposed in workers’ compensation cases. Pariente said the caps lead to arbitrary and sometimes unfair attorney awards and made it harder for workers to find attorneys to represent them. Cases are assigned to each of the court’s seven justices on a rotating basis and that process typically determines who writes the opinion. But justices say there are times — enough that “it’s not surprising” when it happens, says former Justice Harry Lee Anstead — that a justice who is on the dissenting side after the initial internal conference persuades enough colleagues to their side that she or he winds up with the majority — and then writes the opinion. “Justice Pariente has a reputation as one of the court’s hardestworking justices and has been extremely effective in having her perspective on the law announced as the opinion of a majority of the Florida Supreme Court,” says Daniel Nordby, a partner in the Tallahassee office of Shutts & Bowen. Now in her 20th year on the court, Pariente splits her time between Tallahassee and Palm Beach, living alone in the capital during the week when the court is in session and spending weekends at home with Hazouri, who retired from the 4th DCA in 2013 and now works as a mediator. She is in a book club with friends in Palm Beach (she’s been pushing to include more non-fiction), and she and Hazouri have an annual weekend in New York City with Silber and his wife to take in a Broadway show (she’s already seen “Hamilton” — twice). Fellow justices uniformly describe Pariente as a passionate debater during internal conferences — though they all also say she is collegial, willing to listen to all sides of a debate and respectful of those who disagree with her. One of her closest friends on the court was former Justice Raoul Cantero, who served from 2002 to 2008 and frequently argued against Pariente’s interpretations. The two worked out of adjacent offices, ate lunch together and occasionally dined with their spouses. At Cantero’s retirement ceremony, Pariente gave one of the speeches. Outside the court, though, conservatives are more hostile. A few years ago, the Republican-controlled Florida House of Representatives attempted to split the Supreme Court and prevent Pariente — along with Justices Fred Lewis, another Chiles appointee, and Peggy Quince, a joint appointee of Chiles and Gov. Jeb Bush — from voting in any civil cases. Then the Republican Party of Florida urged voters to oppose the three justices’ merit-retention re-elections, the first time a political party had taken sides in a judicial-retention election. Both efforts were unsuccessful, though new House Speaker Richard Corcoran (R-Land O’ Lakes) has suggested he will pursue more court changes. Pariente has, somewhat unusually for a sitting judge, pushed back. She has been critical of the Legislature, as well as Bush and Gov. Rick Scott, for making the judicial nominating process more partisan. She has warned of a “systematic attack” on the judiciary aimed at making the courts “more responsive to special interests.” She has even joked about wishing for the ability to “cross-examine” Republican Party of Florida leaders over claims they made during the 2012 retention campaign. Friends say Pariente, who will be forced to retire from the court in January 2019 after reaching the mandatory retirement age of 70, has come to view the battle to preserve the political independence of the judiciary as a legacydefining issue.